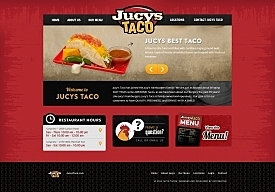 Jucy's Taco has joined the Jucy's Hamburgers family! We are just as excited about bringing EAST TEXAS some AWESOME Tacos, as we have been about our Burgers the past 35 years! Like Jucy's Hamburgers, Jucy's Taco is family owned and operated and we want our customers to have QUALITY, FRESHNESS, and SERVICE WITH A SMILE! Jucy's prides itself on taking the EXTRA STEPS in preparing quality customer favorites! This makes us unique and SIMPLY the BEST!